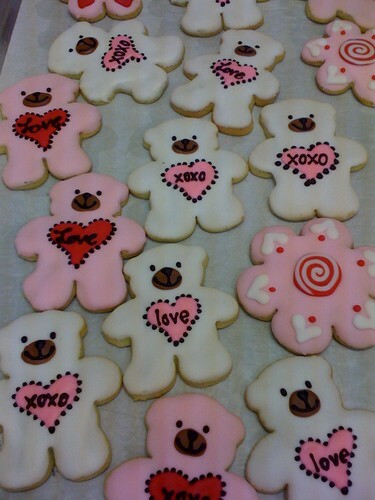 Valentine Bear Society Bakery Sugar Cookies, originally uploaded by SocietyBakery. Homegrown Texas Original. Society Bakery is The little Bakery that Donates Back. We are not “high society”, we give back to society by donating to over 100 charities, schools, and non-profits a year without taking a tax write off. We believe that a business can be profitable and charitable at the same time. In the simplest of senses, it was the cupcakes that led Roshi Muns from her corporate job to the kitchen. It wasn’t a particular endgame she was looking for; she just liked to make cupcakes. Regardless, it led her here – some people bring cupcakes to work in order to garner favor. When Muns brought them, it led to a new career. What Society Bakery has grown into is a nationally recognized sweets destination. Yes, the cupcakes are still there, as large, moist and pillowy as ever, but they sit alongside petite fours, pecan and fig empanadas, multicolored cakes of all shapes and sizes, and cookies and confections innumerable. It’s grown to two retail locations and a loyal customer base. But for Muns to say, ‘It’s grown from there’ and leave it at that would omit an event or two that other businesses likely wouldn’t experience during their development. And while the national recognition was a boon for business, it didn’t change Muns’ baking philosophy in the slightest – ever creative and active, Society Bakery took the accolade in stride and continued their efforts to improve and impress. She does mention, of course, the added benefit of taste testing all the new ideas. In fact, Muns observes that it’s the people around her who help to steer much of the creative drive. That talent, and the input from different perspectives across the board, has led to some offerings at Society Bakery that wouldn’t otherwise be a readily apparent confection. Three years ago, it led to the Bread Pudding Whoopie Pie, and just recently the Pecan Praline empanada. And while she may spend her spare time coming up with new ideas and recipes, it’s what she does with the success those ideas generate that truly sets Society Bakery apart. If it’s positive feedback from charities and customers alike that keep Society Bakery going, it would appear that Muns isn’t heading back to the corporate atmosphere anytime soon. But that doesn’t mean she won’t keep in touch with it – remember that boss who talked her into starting a bakery?